This was my first (and so far only) long-form solo comic work. Published in 2003 by Oni Press, this graphic novel was written, illustrated and lettered by yours truly. I can even be blamed for the pages being printed with green ink. 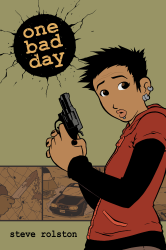 ONE BAD DAY is a pulp adventure story. It revolves around a young woman named Marie who finds herself tumbling from one dangerous situation to another. She’s being chased by bad men with guns and she doesn’t have a clue why. This story is about innocent people being dragged into bad situations and how they deal with it. It’s about how the type of people they are can change in order to survive. It’s also about bad things happening to bad people and how, despite being imperfect members of society, they still have feelings like the rest of us.